With its enormous leaves and brightly-colored blooms resembling the plumes of a jungle bird, bird of paradise is one of the quintessential tropical plants. Fortunately, it is well adapted to container culture, meaning it can be grown anywhere in the country as long as it brought indoors for winter. 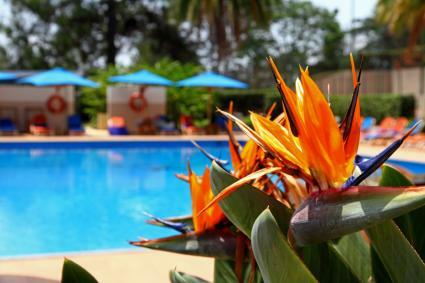 Bird of paradise is the ultimate poolside plant. It has tidy evergreen foliage, blooms for months on end, and conjures up the feeling of a tropical lagoon. Situate it anywhere with at least six hours of sun, preferably among other species with lush foliage so that it blends in to the landscape, rather than looking like a misplaced orphan. Bird of paradise has thick paddle-shaped leaves about six inches wide and up to 18 inches long, each on its own stalk that rises four to six feet from the ground. The foliage grows in thick clumps several feet in diameter, which can develop into large colonies in wet, humid places like southern Florida. The flowers rise on their own stalks to the top of the foliage before opening their exotic blooms. A modified leaf structure forms the green 'beak' of the plant, from which the orange sepals and blue petals emerge. In tropical regions bird of paradise flowers nearly year round, but in temperate climates it is a summer-flowering species. It is possible to grow bird of paradise from freshly harvested seed, but germination is slow and spotty and it can take up to five years for the seedling to mature into flowering plants. For this reason, dividing an existing clump is the preferred method of propagation. Early spring is the best time to make divisions. Simply slice into a mature clump and remove a mass of the tuberous roots. Almost any piece of the roots will grow into a new plant, but the bigger the division, the sooner it will mature to a flowering size. Plant the division in its new home and keep it moist until it begins to put on new growth. Rich, well-drained soil high in organic matter is the preferred growing medium for bird of paradise. Composted manure or a balanced synthetic fertilizer, such as 10-10-10, helps stimulate abundant flowering, though beware of applying excessive nitrogen, as it can promote vegetative growth and reduce the number of flowers. Apply manure as a side dressing in early spring and again in fall. Concentrated synthetic fertilizers should be limited to monthly applications during the growing season only. Weekly soakings during the warm months keeps the foliage lush and the flowers blooming. In the cool months, it is better to let the soil dry quite a bit between waterings to avoid rotting the roots. Keeping mulch around the base of the plants keeps them cool, moist, and slowly conditions the soil with organic matter. Bird of paradise survives the winter in the ground only in frost-free climates. Otherwise, it should be planted in a large tub and brought indoors when nighttime temperatures begin to dip below 50 degrees in fall. 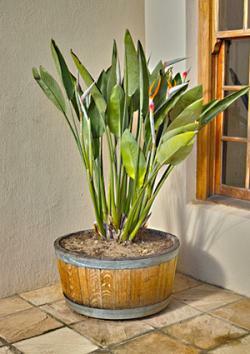 A south-facing window or a room with bright, indirect light is necessary to keep bird of paradise happy indoors. A typical soilless potting mix works well if it is to be grown in a pot. Containers need to be at least 20 gallons in size to allow bird of paradise to grow into a clump of sufficient size to flower. Besides making it possible to bring the plants indoors in winter, the constricted root space of a pot actually induces more prolific flowering in bird of paradise. These are truly low maintenance plants. Tattered leaves and spent flower stalks should be cut to the ground periodically, but otherwise there is little to do for a bird of paradise except to keep it watered. Root rot is the only disease to watch out for, though this is only an issue in poorly drained soil or as a result of over watering. Aphids, scale and spider mites can be an issue, especially on indoor plants. Insecticidal soaps are an effective remedy, but spraying off the foliage on a regular basis and wiping off any remaining insects with a rag is enough to keep light infestations at bay. The typical orange bird of paradise is the by far the most common variety, though there is a yellow-flowered variety called Mandela's Gold and a dwarf variety called Juncea that are occasionally available in nurseries. There are other types bird of paradise, though these are rarely grown outside of tropical areas as they are much larger and not suitable for containers. Stokes Nursery has been growing tropical plants for over 100 years and offers bird of paradise in 10-inch pots for around $30. Stokes Tropicals offers a 10-inch pot for about $50. The plant is 2 to 3 feet high. Hirt's Gardens is the price comparison winner, offering it in a 6-inch pot for less than $15. 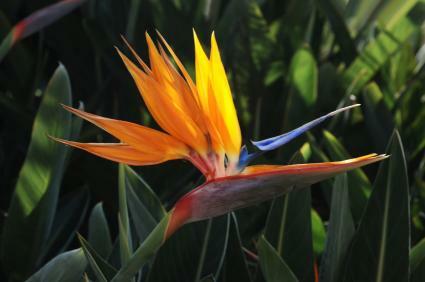 There are few plants that will grow in temperate climates that have the exotic flavor of bird of paradise. Adding a few potted specimens are an easy way to create a lush, tropical ambiance around a water feature or on any deck, patio, or poolside area.